Cinnabon partners with Lotus Biscoff brand speculoos cookies to offer the limited-time option to top any cinnamon roll with Biscoff Cookie crumbles. Prices range from $3.49 to $4.79 depending on the size of the cinnamon roll. 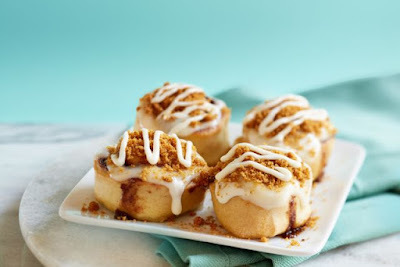 You can also get the cookie crumbles on top of the chain's Center of the Roll. Additionally, Cinnabon is serving up the Biscoff Cookies & Cream Chillatta for a limited time. The frosty dessert features Biscoff cookie flavor and caramel sauce blended into a vanilla frappe and then finished with whipped cream and cookie crumbs. Prices for the Chillatta start at $2.99 for a 10-oz cup, $4.19 for a 16-oz cup, and $4.99 for a 24-oz cup.